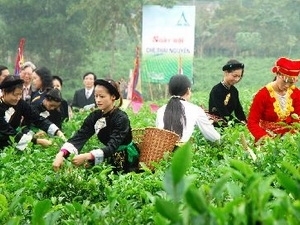 The second Thai Ngu yen – Vietnam Tea Festival will take place in the northern province of Thai Nguyen from November 9-11. The festival will draw the participation of 34 domestic provinces, 25 tea companies and 50 traditional tea villages around the country. Representatives from embassies, consulates and diplomatic agencies of the countries under the World Green Tea Festival will also attend. The three-day event features a wide variety of activities, including an opening ceremony, a seminar on tea products and investment promotion of the tea industry, a cultural festival, a tea carnival, a ‘Miss Tea Land’ contest and a closing ceremony. A photography exhibition introducing Thai Nguyen tea and Vietnam’s landscapes and people, a village market featuring tea products and various sporting activities will also take place during the festival. The biennial festival aims to introduce Thai Nguyen tea products and honour Vietnamese tea culture. It also offers a good opportunity for domestic and foreign tea producers to exchange experience on tea growth and processing.